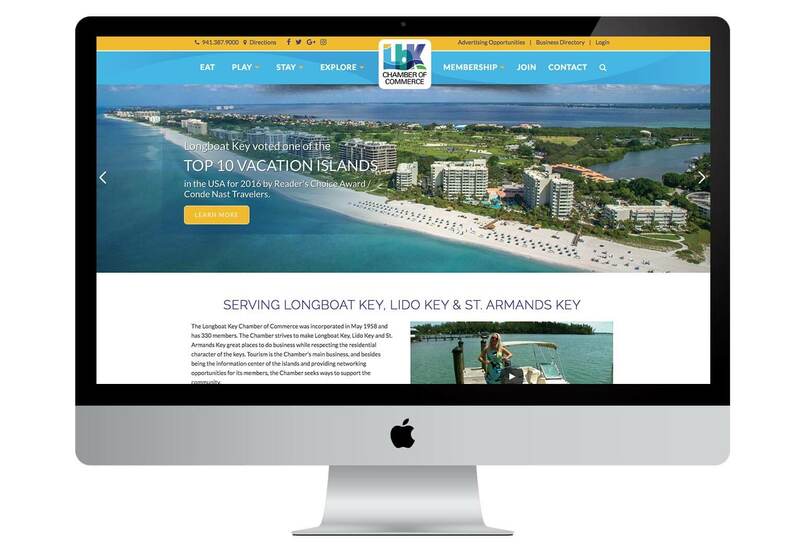 The Longboat Key Chamber of Commerce’s website is a redesign which we targeted more towards travelers than members. As members of LBK’s marketing board, we understood their main goal was to increase traffic and user engagement. The chamber members benefit from the new website in that more travelers are seeing their ads and finding their listings on pages visited. Information about Longboat Key’s beautiful beaches, activities, and culture is visually accessible and highly interlinked. The site uses a highly customized version of the X-theme which we made very clean, yet colorful. The old website had an overly complicated navigation which we simplified into ‘Eat, Play, Stay, Explore.’ Under those headings, we designed a well organized ‘mega menu.’ On the right side of the centered logo in the top navigation are links which relate to membership. By scrolling down the home page, one can see all that Longboat Key has to offer. We have call-to-actions for the newsletter subscription and for visitors to reach out to the chamber staff for the Information Guide. We have business listings on pages about Longboat. A graphic mini nav of links from the ‘Explore’ tab is accessible on every page to increase conversion. Since we’ve launched LBK’s new website, they have seen a 45% increase in traffic! User engagement has been great for the chamber and its members.